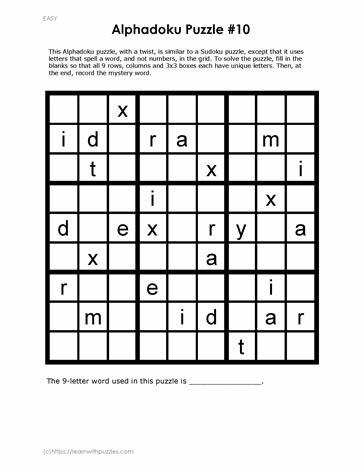 Use logical reasoning skills and basic Sudoku rules to solve the this alphadoku puzzle. Remember that each of the unique 9 letters used can only be found once in each column, once in each row, and once in each three-by-three grid. Once the puzzle is solved, record the nine letter word used to create this puzzle in the area below.